BREDL fact sheets on individual asphalt plants in our region. The 1990 Clean Air Act Amendments Title V established a federal operating permit system administered by the states. Title V permits are designed to gather all existing, federally enforceable laws and regulations into one permit. Federally enforceable laws include all EPA regulations and any state and local regulations approved by the EPA. The State Implementation Plan (SIP) embodies all EPA-approved state regulations. A state regulation is not part of the SIP and not federally enforceable until it is submitted to and approved by the EPA. EPA approval allows enforcement by federal agencies and by citizens under the Clean Air Act. The international market for natural gas is driving the construction of new interstate pipelines in the USA. In the United States, the major end uses of natural gas are electric power generation, industrial process, residential and commercial buildings. 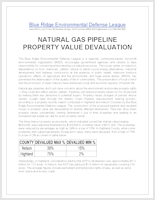 Property values plunged on parcels whose owners sought relief through the Atlantic Coast Pipeline reassessment hearing process, according to a property records search conducted in Highland and Nelson Counties by the Blue Ridge Environmental Defense League. The construction of the proposed pipeline and resultant losses in property value are devastating for directly affected landowners. Pipelines drive down property values substantially, limiting landowner`s use of their properties and leading to an increased real estate tax rate for every property owner. Clinch River Nuclear Site is located in Roane County, Tennessee, about 25 miles from Knoxville. In 2016 Tennessee Valley Authority submitted an application asking for approval of its Clinch River site near Oak Ridge National Laboratory. 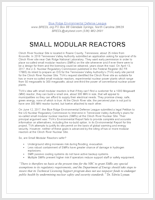 They want early permission in order to place so-called small modular reactors (SMRs) on the site whenever and if ever there were to be a design for them and the licensing could be obtained, years down the road. On April 13, 2017, the U.S. Nuclear Regulatory Commission published in the Federal Register (82 FR 17885) its intent to prepare an EIS for the Tennessee Valley Authority’s (TVA) early site permit for the Clinch River Nuclear Site. TVA’s request identified the Clinch River site as suitable for two or more so-called small modular reactors, experimental nuclear power plants which range from 50 megawatts to 300 megawatts, about one-third the power of conventional nuclear power plants. The Savannah River Site (SRS) is a nuclear industrial complex operated by the US Department of Energy (DOE). It covers 310 square miles and stretches into parts of Aiken, Barnwell, and Allendale Counties; the Savannah River, which separates South Carolina from Georgia, borders it to the southwest. 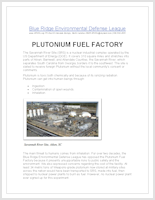 For over two decades, the Blue Ridge Environmental Defense League has opposed the Plutonium Fuel Factory because it presents unsupportable risks to public safety and the environment. We also expressed concerns regarding the cost of the facility. 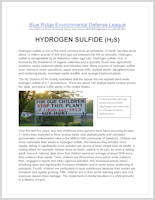 Hydrogen sulfide is one of the most common toxic air pollutants. In North Carolina alone about 12 million pounds of this toxic gas are released into the air annually. Hydrogen sulfide is recognizable by its distinctive rotten egg odor. Hydrogen sulfide, H2S, is formed by the breakdown of organic materials and is typically found near agricultural locations, waste treatment plants and industrial sites. LOCAL ORDINANCES: What North Carolina Counties Can Do to Protect Residents from Polluting Industries - North Carolina law grants authority to all counties the power to adopt ordinances under NC General Statute § 153A-121. This is also referred to as the counties’ police power. Recent legislation approved by the NC General Assembly alters but does not end this power. So they want to mine and mill uranium in a FEMA flood zone? Download the BREDL brochure: TOO MUCH RISK - So they want to mine and mill uranium in a FEMA flood zone? Whats wrong with this picture? The International Atomic Energy Agency (IAEA) gives many clear warnings of the risk of radioactive contamination brought by flooding in areas where uranium mill tailings are being stored. March 2011: BREDL fact sheet on Green Energy Partners proposed biomass gasification plant. 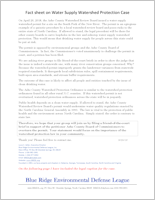 April 2009: Fib-rowatt Facts- It's time to tell the truth: BREDL Factsheet on Fibrowatt's proposal to build three poultry waste incinerators in North Carolina. Montenay Charleston Resource Recovery, Inc. operates a mass burn incinerator in Charleston, SC. 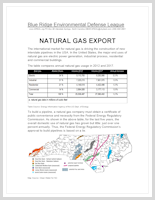 May 2008 Factsheet: New Nuclear Power Plants in South Carolina? - Duke Energy has applied to the US Nuclear Regulatory Commission for a license to build and operate two nuclear plants on the Broad River near Gaffney, South Carolina. The deadline for comments on environmental impacts of a nuclear power plant on this areas air, water, and public health is May 20, 2008. March 2008: BREDL Brochure - "Neighbor-to-Neighbor:" What Do You Think About Spreading Sewage Sludge on Farmland? January 2008: National Bio and Agro-Defense Facility Factsheet - Why NBAF is a weapons lab. 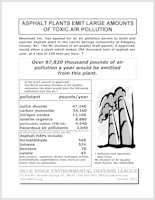 October 2007: Proposed Young & McQueen asphalt plant Factsheet - Young & McQueen are proposing an asphalt plant near Spruce Pine in Mitchell County, NC. July 11, 2007: (revised March 2008) Poultry power is dirtier than coal. Poultry Litter versus Coal-fired Power Plants: An Air Pollution Comparison - The graph illustrates the negative air pollution impacts of power plants powered by poultry litter compared with boilers fired by coal. April 2006: The Safe Energy Campaign Factsheet - On March 16, 2006 Duke Power Co. and Southern Co. announced that they had picked a site in South Carolina for a new nuclear power plant. Also, the power companies announced plans to seek early site permits for additional nuclear reactors at Oconee, SC and at a new site near Winston-Salem, NC. March 21, 2006: Fibrowatt Factsheet - Fibrowatt LLC is considering locations in North Carolina for a 50 MW plant that burns poultry litter. Burning poultry litter creates unnecessary pollution and is inconsistent with NC GreenPowers mission to promote renewable energy while protecting the environment. Nov. 5, 2005: Toxic Air Pollution Levels in Canton, NC from Blue Ridge Paper Products, Inc.
May 2005: New Nuclear Plant Sites on the Yadkin River, NC? Mar. 24, 2004: Three Mile Island 25 years later, TMI facts - Three Mile Island VA? Feb. 27, 2004: North Anna - New Nuclear Power Plants in Virginia? Sept. 11, 2003: BREDL Factsheet on Waste Industries USA, Inc. which has operations throughout North Carolina and the Southeast. Aug. 24, 2003: North Carolina Ridge Law Fact Sheet: NC Ridge Law is no obstacle to wind power. 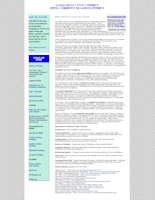 Aug. 22, 2003: North Carolina Green Power Fact Sheet: NC Green Power Program - Don't Buy It! Nov. 12, 2002: Landfills Fail factsheet: Solid Waste landfill technology: a documented failure. Nov. 12, 2002: Interstate Waste Commerce and the Law: When Commercial landfill companies enter, Communities loose control. April 24, 2002: High-level Nuclear Waste Transport Fact Sheets for North Carolina, South Carolina, Georgia , Tennessee, and Virginia.